WAS Jesus three days and three nights in the grave, as He said in Matthew 12:40? Can you figure three days and three nights between sunset "Good Friday" and sunrise Easter Sunday? We have never published an article that stirred more comment and enthusiastic endorsement than this article. 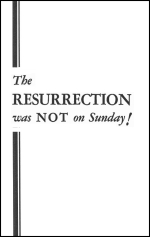 IT is commonly supposed, today, Jesus was crucified on FRIDAY, and that the resurrection occurred about sunrise on Easter Sunday morning. It would seem that no one, until recently, ever thought to question or to PROVE this "Good-Friday-Easter" tradition. Yet the Bible tells us to PROVE all things. And you will be literally astounded by this proof. For PROOF there is but one dependable authority; a sole historical record - the Bible.